Seaborn aims to make visualization a central part of exploring and understanding data. The plotting functions operate on dataframes and arrays containing a whole dataset and internally perform the necessary aggregation and statistical model-fitting to produce informative plots. Seaborn’s goals are similar to those of R’s ggplot, but it takes a different approach with an imperative and object-oriented style that tries to make it straightforward to construct sophisticated plots. If matplotlib “tries to make easy things easy and hard things possible”, seaborn aims to make a well-defined set of hard things easy too. If, like me, your primary exposure to visualization tools is Excel, then this mindset is a bit foreign. As I work with seaborn, I sometimes fight with it when I try to treat it like creating an Excel chart. However, once I started to produce some impressive plots with seaborn, I started to “get it.” There is no doubt I am still learning. One thing I have found, though, is that if you are in a business setting where everyone sees the normal (boring) Excel charts, they will think you’re a genius once you show them some of the output from seaborn! 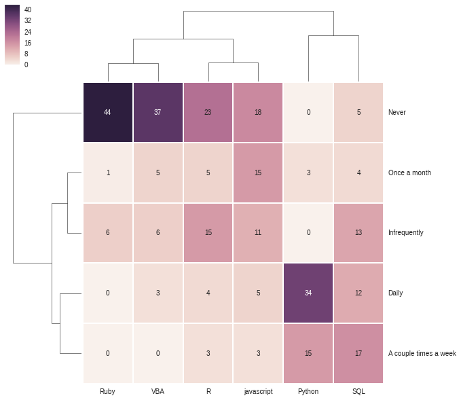 The rest of this article will discuss how to visualize the survey results with seaborn and use the complex visualization to gain insights into the data. In addition to this article, a more detail notebook is hosted in the github repo. SPREADSHEET = "PBPython User Survey (Responses)"
Please refer to the notebook for some more details on what the data looks like. Since the column names are so long, let’s clean those up and and convert the timestamp to a date time. The basic data is a little easier to work with now. The first thing we’ll look at is the free form suggestions. Since there are only a small number of free form comments, let’s strip those out and remove them from the results. Since there are only a small number of comments, just print them out. However, if we had more comments and wanted to do more analysis we certainly could. I’m using display for the purposes of formatting the output for the notebook. Add some other authors to the website which can publish equally relevant content. Would  be nice to see more frequent updates if possible, keep up the good work! How to produce graphics using Python, Google Forms. Great job on the site. Nice to see someone writing about actual Python use cases. So much writing is done elsewhere about software development without the connection to actual business work. Drop the suggestions. We won’t use them any more. I do think it is interesting that several suggestions relate to graphics/presentations so hopefully this article will be helpful. Because we only have 1, 2, 3 as options the numeric results aren’t telling us that much. I am going to convert the number to more useful descriptions using map . This change will be useful when we plot the data. Value counts give us an easy distribution view into the raw numbers. Use normalize to see it by percentage. While the numbers are useful, wouldn’t it be nicer to visually show the results? Seaborn’s factorplot is helpful for showing this kind of categorical data. Because factorplot is so powerful, I’ll build up step by step to show how it can be used for complex data analysis. 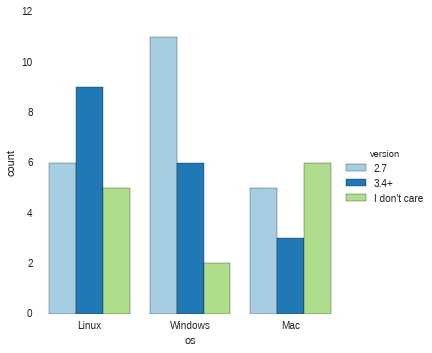 First, look at number of users by OS. 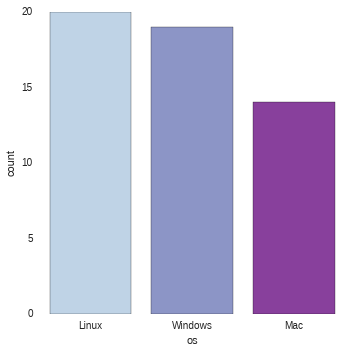 This is useful but wouldn’t it be better to compare with OS and preferred python version? This is where factorplot starts to show more versatility. The key component is to use hue to automatically slice the data by python version (in this case). Because seaborn knows how to work with dataframes, we just need to pass in the column names for the various arguments and it will do the analysis and presentation. How about if we try to see if there is any relationship between how useful the site is and OS/Python choice? We can add the useful column into the plot using col . Images have been resized for the article. The originals look sharp and are easier to read. 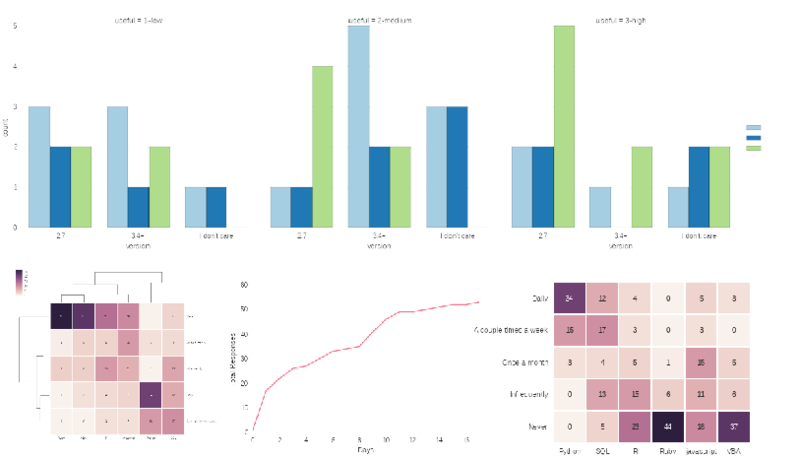 Once you get used to how to use factorplots, I think you will really be impressed with their versatility and power.  You probably also noticed that I used different palettes in the graphs. I did this on purpose to show how much change can be made by tweaking and changing the palettes. Another useful view into the data is looking at the responses over time. The seaborn’s timeseries supports this type of analysis and much more. For ease of calculating responses over time, add a count colum for each response and set the timestamp as our index.  To label the x-axis we need to define our time range as a series from 0 to the max number of days. Seaborn timeseries are really meant to do so much more but this was a simple view of how it could be applied to this case. It is pretty clear that responses jumped up when the article was published then again when it was re-tweeted by others. The final section of data to analyze is the frequency readers are using different technology. I am going to use a heatmap to look for any interesting insights. This is a really useful plot that is not that commonly used in an environment where Excel rules the data presentation space. Let’s look at the data again. The trick is going to be getting it formatted in the table structure that heatmap expects. What we need to do is construct a single DataFrame with all the value_counts for the specific technology. First we will create a list containing each value count. Now, concat the lists along axis=1 and fill in any nan values with 0. We have a nice table but there are a few problems. First, we have one column with blank values that we don’t want. Secondly, we would like to order from Daily -> Never. Use reindex to accomplish both tasks. 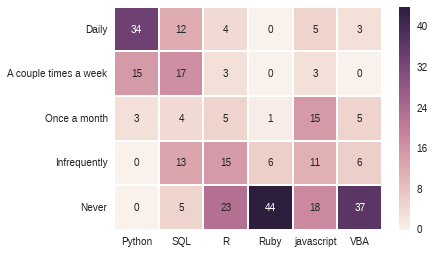 Not surprisingly, most people use python very frequently. Additionally, it looks like very few survey takers are using Ruby or VBA. A variation of the heatmap is the clustermap. The main feature is that it tries to reorganize the data to more easily see relationships/clusters. At first glance, it may seem to be a repeat but you’ll notice that the order of the axes are different. 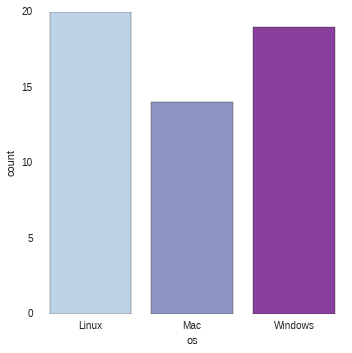 For instance, python and SQL are clusterd in the lower right with higher usage and Ruby and VBA have a cluster in the upper left with lower usage. The notebook in the github repo has even more detail of how to manipulate the resulting data and create the reports shown here. I encourage you to review it if you are interested in learning more. It may take a little time to get the hang of using seaborn but I think you will find that it is worthwhile once you start to get more comfortable with it.